Every spring, it seems, I go on the hunt for a baseball-themed pinball game, and every spring, I quickly have my hopes dashed. This must be what it’s like to root for the Mets. Last season’s hopeful, Super Tilt Baseball, was undone by bugs and poor gameplay. (In an update after we posted our review, the developer tackled many of those bugs; the poor gameplay remains.) This year, Hit the Deck Baseball from Smashed Fly gets its turn at the plate. And while the game certainly doesn’t swing and miss, it’s definitely not a home run—more like a grounder that dribbles just past the infielder’s outstretched glove. 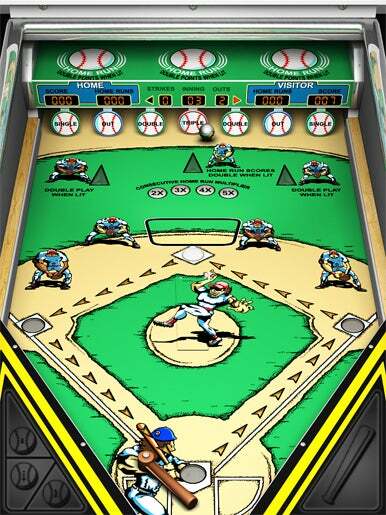 Available in separate iPhone/iPod touch and iPad versions, Hit the Deck Baseball recalls the mechanical pinball games found in the penny arcades of yore. A ball pops out of the pitcher’s mound, you tap a button to swing a bat, and you hope that the ball bangs into a target signifying a base hit and not an out. At random times in Hit the Deck Baseball, a ramp pops up behind second base—hit your ball straight and true, and it will sail over the wall for a home run. Swing for the Fences: In Hit the Deck Baseball, you try and rack up base hits and runs by knocking around a pinball—in this instance, the ball is about to hit the triple target. Baserunners are designated by a white—and fairly dull-looking—light. Hit the Deck Baseball features some appealing cartoonish graphics and good sound effects. So what’s the problem? The gameplay quickly becomes dull and repetitive. At the end of the day, you’re tapping a single button, waiting to see if you’ve made a hit or out, and then repeating the process. The fact that Hit the Deck Baseball uses simple white lights to signify base runners and bonuses instead of something more colorful also fails to liven things up. At least, the iPad version of Hit the Deck Baseball can take advantage of that device’s larger screen so that you can make out the details of playing surface. Hit the Deck Baseball for iPhone is the same game shrunken down to fit on the iPhone or iPod touch; as a result, you lose a lot of the details. For example, when you pitch to an opponent, you have choose from three buttons—a fast ball, a slow ball, and a curve—but on the iPhone’s smaller screen, it’s difficult to spot which button is which. In another instance, I found myself making two outs with one swing in the iPhone version of the game; it wasn’t until I tested the iPad edition that I noticed a light indicating that a double play ball was in effect. That light is rather difficult to make out within the confines of an iPhone or iPod touch. Hit the Deck Baseball isn’t a bad pinball game, just an uninspired one. Whatever amusement you derive from it is unlikely to last throughout the long baseball season.